4. Cytokines; compounds such as IGF-1 and 2, TGF, EGF, PDGF and many others which are involved in the cell to cell recognition and replication pathways. 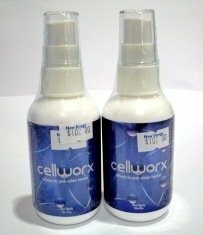 CELLWORX® is a targeted extract from pure colostrum that utilises a unique delivery system within the body to get directly in to the blood stream. The liquid CELLWORX® extract is sprayed under the tongue. It is important to hold the CELLWORX® under the tongue for as long as possible. This sublingual delivery system completely avoids any loss of important bioactives that can occur through gastric juices in the digestive system. The active compounds in CELLWORX® are adsorbed directly in to the bloodstream by a process called transmucosal adsorption. This process is unique to the area of skin under the tongue. Once the active compounds in CELLWORX® are in the blood stream they are distributed around the body. Some enter the important bone marrow tissue. These active compounds attach to receptors on the cell walls of all immune cells, including stem cells. As they attach they turn on mechanisms within the cell which instruct the cells what to do. These compounds teach our immune system and other important body systems how to function at optimum levels. Free delivery for Singapore only.